If you haven’t yet shopped the much-hyped Victoria’s Secret Semi-Annual Sale, the savings event is still underway, offering discounts of up to 60% on popular styles. Now the retailer is enticing cyber customers with free shipping for online purchases for a limited time. 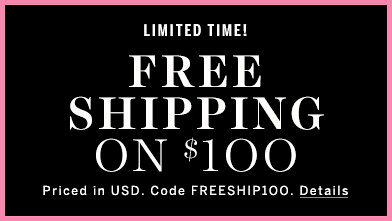 • Use promo code FREESHIP100 to get free shipping on orders of $100 or more. This code is valid through Jan. 20. • Use promo code LOVEBRAS to get free shipping with bra purchases, excluding clearance items. This code is valid through Jan. 14. Visit the retailer’s website for full details. For more information about the Victoria’s Secret Semi-Annual Sale, check out our Semi-Annual Sale Guide.